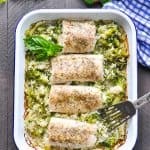 ​​​​​​​This Dump-and-Bake Italian Fish Recipe with Broccoli and Rice is an entire meal that cooks in one dish! Preheat oven to 375 degrees F. Spray a large baking dish (about 9 x 13 inches) with cooking spray. In prepared dish or in a separate bowl, whisk together condensed soup, water, ¼ teaspoon of Italian seasoning, garlic powder, ½ teaspoon of salt, and ¼ teaspoon of pepper. Stir in uncooked rice and frozen broccoli. Transfer to the prepared baking dish and cover tightly with foil. While the rice is in the oven, pat the fish dry and rub with olive oil. Season with salt and pepper to taste, and sprinkle with remaining ½ teaspoon of Italian seasoning. Sprinkle Parmesan cheese on top. After the rice has baked for 30 minutes, remove from the oven, stir, and place the fish fillets on top. Cover with foil and return to the oven for 20-25 more minutes, or until fish flakes easily with a fork and rice is tender. For a crispy finish on the fish, during the final 3-5 minutes of baking time, I like to remove the foil and put the dish under the broiler. Cooking Just for Two? Cut the ingredients in half and bake the fish in an 8-inch square pan. The rest of the cooking instructions remain the same.